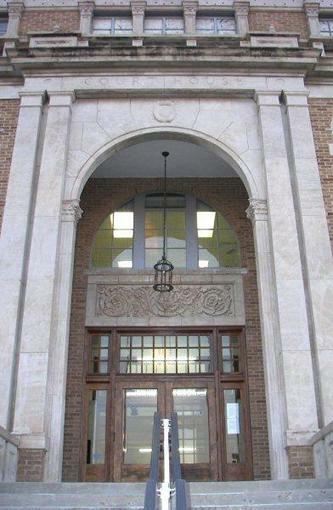 Hutchinson County Courthouse, Stinnett, Texas. 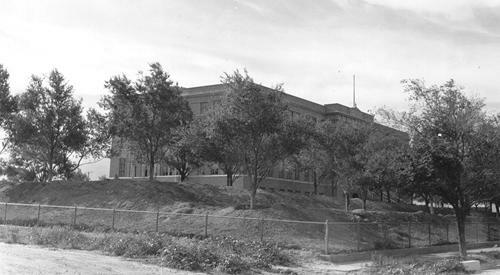 The 1927 Hutchinson County Courthouse. 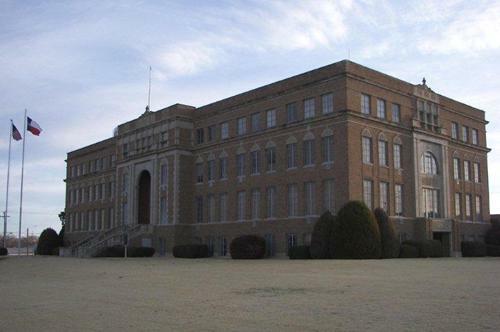 This 1927 Hutchinson County Courthouse replaces one built just the year before. This one is built of brick and concrete in the style known as Texas Renaissance. Designed by William Townes, who later became half of Townes and Funk, designers of the Ward County Courthouse among others. Hutchinson County, named for prominent judge and writer Anderson Hutchinson, was one of 54 counties created out of the District of Bexar in 1876 by the Texas Legislature. It was not until 1901, however, that the county was officially organized. That year a temporary county courthouse was erected in the county seat of Plemons. A permanent courthouse was built in Plemons by contractor E. E. Ackers. Stinnett replaced Plemons as Hutchinson County Seat in 1926. 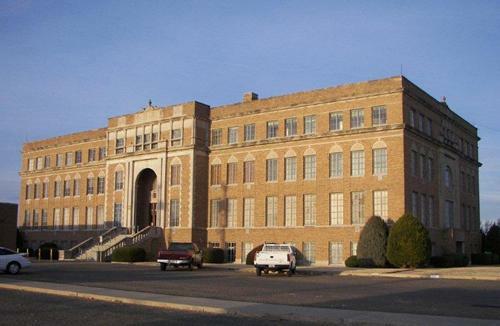 The county courthouse was temporarily housed in an office building in downtown Stinnett in 1926 before this courthouse was erected in 1927 at a time of major oil discoveries in the area. Designed by Amarillo architect W. C. Townes and built by local contractor C. S. Lambie & Company, the Spanish renaissance revival style building also housed the county jail. It features brick construction with cut-stone ornamentation, a 3-bay primary facade with grand entry bay, raised basement with end entries, metal sash windows and second floor window with round-arch stone lintels. 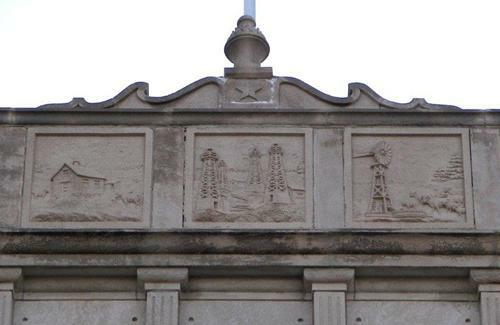 Friezes at the east and west entrances of the courthouse depict the petroleum, farm and ranch, and cattle industries, historically the three principal commercial enterprises in the area. Recorded Texas Historic Landmark, 1962. 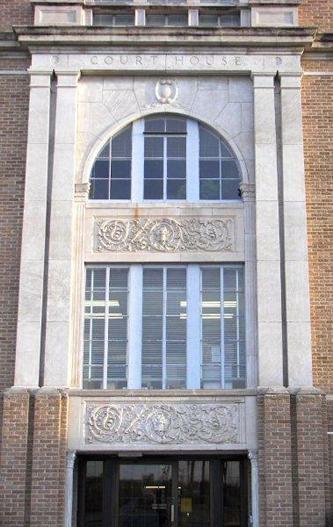 "Detailed panel over the south side entrance. 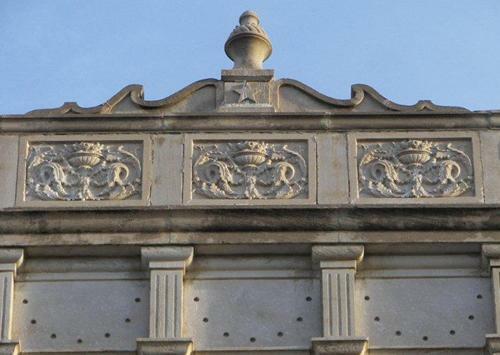 This design, along with other stone carved designs, are repeated on all sides of the building." "Roof detail over the south side entrance. The empty panels on the bottom (with the holes that look like smiley faces) repeat on each side of the building, as if something was removed from these spaces."